"Data suggest that global shark catches now exceed one million tonnes per year, more than double what they were six decades ago. This overexploitation now threatens almost 60% of shark species, the highest proportion among all vertebrate groups." said HKU School of Biological Sciences Professor Yvonne Sadovy, lead author of the study. "Hong Kong is the port of entry for about half of all officially traded dried shark fins globally, importing around 6,000 tonnes per year in recent years." Professor Sadovy explained. A 2017 study showed that 33% of shark fins found on sale in Hong Kong's dried seafood stores were from species listed as Threatened by the International Union for Conservation of Nature (IUCN). 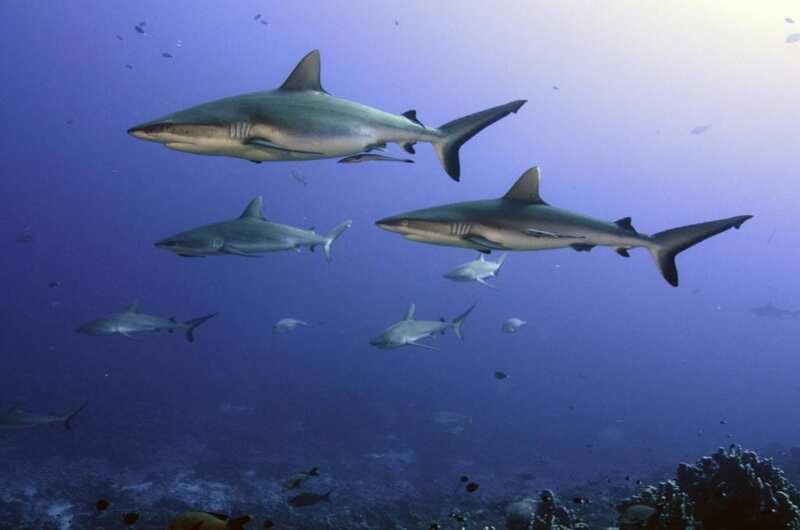 It is estimated that only 12% of shark fisheries are considered potentially sustainable, indicating that 25,000 tonnes of dried fins each year originate from other unsustainable, often illegal, fisheries. Distinguishing the species from which fins are sourced can be extremely difficult, as the mixing of catches is a common practice that hampers traceability efforts, and many fins look similar. "Shark finning and the mixing of catches tend to take place in the open seas or in remote ports, where there is little to no oversight. Moreover, authorities show little interest in controlling illegal wildlife trade, including that in shark fins. Even if they do, their enforcement capabilities are very limited because they cannot inspect and run DNA tests on every single fin that arrives at their customs to determine the area where the shark was caught, or even determine the species," said co-author Professor Daniel Pauly, Principal Investigator with the Sea Around Us at UBC. In the view of the researchers, waiting for multilateral organizations to develop and enforce rules regarding shark fishing and regulate the fin trade is not an option both because available enforcement and compliance systems are far too poorly applied for wildlife trade in most countries trading fins, including mainland China, and because it would likely take too long and that is a luxury not currently afforded to many shark species. While there is much scope for enforcement of existing laws controlling catching and international trade to improve, this will take time and is unlikely to improve in the near future. "The exclusivity linked to a natural product combined with its limited supply in the wild increases its price and makes it an attractive trading good for business networks, including extensive illegal trade. This trade is simply proving too difficult for authorities to control." Professor Sadovy added. "Consumers have to act fast and decide what is acceptable and what is not when it comes to vulnerable, uncontrolled species. Traditions change all the time according to new knowledge and shifting values. So while the appetite for shark fin soup is growing in places like Thailand and Macau it is slowly declining in Hong Kong and mainland China, where young people are starting to see it as a cultural practice that is worth abandoning." Professor Pauly said. Global shark catch levels have more than doubled since 1960 and populations of some shark species such as hammerhead and oceanic whitetip have declined by over 90 per cent in recent years largely because of wealthy Chinese consumers' appetite for shark fin soup, the paper states. The authors call on consumers to reject the luxury dish and for authorities to employ the precautionary principle by protecting sharks more effectively. The shark fin trade is used as an example of the challenges of controlling growing international trade in for high value markets that increasingly threaten wildlife. "Extinction must not make the decision for us." commented Professor Sadovy "We must either control ourselves to ensure sustainable exploitation and trade, or stop trade in luxury species or products that seriously threaten their future on our planet." The paper "Out of Control Means Off the Menu: The Case for Ceasing Consumption of Luxury Products from Highly Vulnerable Species when International Trade Cannot be Adequately Controlled; Shark Fin as a Case Study" was recently published in Marine Policy.